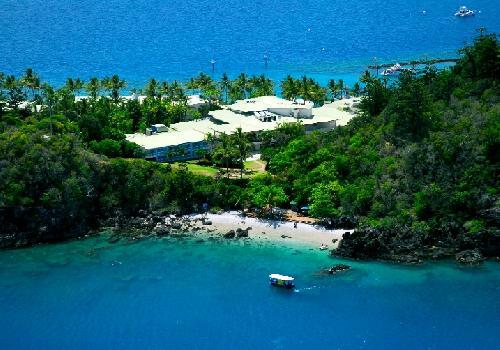 If you are looking for a place to holiday where all of your dreams come true then Daydream Island Resort and Spa is the perfect place for your next vacation. It not only has a wide selection of things that you can do whilst staying on the island but it also features stylish accommodation with all of the in-room facilities to meet you every need and the warm, tropical weather on the island is enough on its own to lift your our spirits. At the Daydream Island Resort you can do as little or as much as you want. Either lay on the beautiful beach and relax with a good book and a cocktail or take to the skies with adventure activities like parasailing and scenic flights over the whole Whitsunday region. The Daydream Island Resort and Spa is a multi award-winning resort that is perfectly located in the heart of Queensland's Great Barrier Reef and just a short distance from the Airlie Beach Marina and Shute Harbour. For many years people who have some to stay at this tropical island paradise have found a world of fun, adventure, romance and relaxation that really does have to be experienced to be believed. Our Rejuvenation Spa offers vichy showers, mud wraps, a variety of massages, thermal baths, hydro treatments, and a fully qualified Naturopath on the island. As you would expect from a place called Daydream Island there is plenty of things to see and do which will ensure that all of your holiday dreams come true. This includes such things as tours around the Whitsundays including Great Barrier Reef, Whitehaven Beach and other islands, helicopter joyrides, 3 swimming pools and spas with pool activities, a fully equipped gymnasium, open air cinema, nightly entertainment for guests to enjoy, 2 floodlit tennis courts, kayaking, walks around the rainforest, beach volleyball, fish, shark and sting-ray feeding, a children's playground, snorkelling, scuba pool training and lessons, 19 hole mini golf course, pool table, parasailing, jet skiing, banana rides, wakeboarding, waterskiing & kneeboarding.